As the player, your mission is to rid your home planet of the enemy forces that have taken over. You are a solo assault force armed with the supreme weapon, a highly mobile tank with powerful weapons. Lile no other tank game, Assault has new control functions that make the vehicle unusually responsive. To quickly avoid enemy shots, the tank can Rapid Roll to either side. In addition to the standard artillery guns, grenades cna be launched at the enemy forces from the Power Wheelie position. Assault's 360° scrolling playfield makes the player's controls very easy to use. The player's tank remains in the center of the screen as the world around him rotates 360° in response to his movements. An arrow points the way toward the exit to each level. 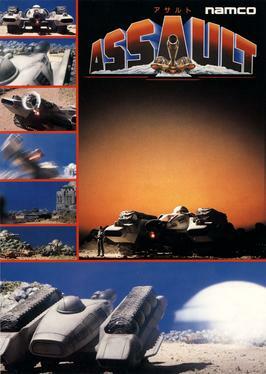 Assault's "lift zones" give an innovative visual effect and game play advantages not found in any other game. When the player drives onto the lift zone, his tank jets straight up into the air to get a bird's eye view of the surrounding terrain and enemy lines. From this overhead position, the player can bomb the enemy outposts. Add Assault to your arsenal today and blow your competition away!